Two years before the Sept. 11 attacks, an analysis prepared for U.S. intelligence warned that Osama bin Laden's terrorists could hijack an airliner and fly it into government buildings like the Pentagon. 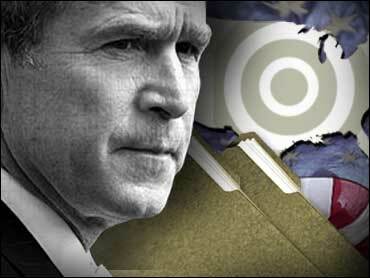 The Bush administration has asserted that no one in government had envisioned a suicide hijacking before it happened. "Had I know that the enemy was going to use airplanes to kill on that fateful morning, I would have done everything in my power to protect the American people," Mr. Bush told U.S. Air Force Academy football team members who were visiting the White House on Friday. It was his first public comment on revelations this week that he was told Aug. 6 that bin Laden wanted to hijack planes. CBS Senior White House Correspondent Bob Schieffer reports that other top officials were less forthcoming. The usually talkative Attorney General John Ashcroft just stared when reporters asked him about the terror warnings. FBI Chief Robert Mueller also refused to comment. White House press secretary Ari Fleischer said the administration was aware of the 1999 report prepared by the Library of Congress for the National Intelligence Council, which advises the president and U.S. intelligence on emerging threats. He said the document did not contain direct intelligence pointing toward a specific plot but rather included assessments about how terrorists might strike. "What it shows is that this information that was out there did not raise enough alarm with anybody," Fleischer acknowledged. Former CIA Deputy Director John Gannon, who was chairman of the National Intelligence Council when the report was written, said officials long have known a suicide hijacking was a threat. "If you ask anybody could terrorists convert a plane into a missile, nobody would have ruled that out," he said. Democrats and some Republicans in Congress Friday raised the volume of their calls to investigate what the government knew before Sept. 11. "I think we're going to learn a lot about what the government knew," Sen. Hillary Rodham Clinton said during an appearance in New York. She said she was unaware of the report created in 1999 during her husband's administration. Sen. Charles Grassley, a senior member of the Senate Judiciary and Finance committees, demanded the CIA inspector general investigate the report, which he called "one of the most alarming indicators and warning signs of the terrorist plot of Sept. 11." Meanwhile, court transcripts reviewed by The Associated Press show the government had other warning signs between 1999 and 2001 that bin Laden was sending members of his network to be trained as pilots and was considering airlines as a possible target. The court records show the FBI has known since at least 1999 that Ihab Mohammed Ali, who was arrested in Florida and later named as an unindicted co-conspirator in the 1998 U.S. Embassy bombings in Africa, had been sent for pilot training in Oklhhoma before working as a pilot for bin Laden. He eventually crashed a plane owned by bin Laden in Sudan that prosecutors alleged was used to transport al Qaeda members and weapons. Ali remains in custody in New York. In February 2001, federal prosecutors told a court they gained information in September 2000 from an associate of Ali's, Morrocan citizen L'Houssaine Kherchtou, that Kherchtou was trained as an al Qaeda pilot in Kenya and attended a meeting in 1993 where an al Qaeda official was briefing Ali on Western air traffic control procedures. "He (Kherchtou) observed an Egyptian person who was not a pilot debriefing a friend of his, Ihab Ali, about how air traffic control works and what people say over the air traffic control system," then-Assistant U.S. Attorney Patrick Fitzgerald told a New York court. "And it was his belief that there might have been a plan to send a pilot to Saudi Arabia or someone familiar with that to monitor the air traffic communications so they could possibly attack an airplane perhaps belonging to an Egyptian president or something in Saudi Arabia." That intelligence is in addition to information the FBI received in July 2001 from its Phoenix office that a large number of Arabs were training at U.S. flight schools and a briefing President Bush received in August of that year suggesting hijacking was one possible attack the al Qaeda might use against the United States. The September 1999 report, entitled "Sociology and Psychology of Terrorism: Who Becomes a Terrorist and Why?" described suicide hijacking as one of several possible retribution attacks the al Qaeda might seek for a 1998 U.S. airstrike against bin Laden's camps in Afghanistan. The report noted an al Qaeda-linked terrorist first arrested in the Philippines in 1995 and later convicted in the 1993 World Trade Center bombing had suggested such a mission. "Ramzi Yousef had planned to do this against the CIA headquarters," the report said. Bush administration officials have repeatedly said no one in government had imagined such an attack. "I don't think anybody could have predicted that ... they would try to use an airplane as a missile, a hijacked airplane as a missile," National Security Adviser Condoleezza Rice said Thursday. The report was written by the Federal Research Division, an arm of the Library of Congress that provides research for federal agencies. "This information was out there, certainly to those who study the in-depth subject of terrorism and al-Qaeda," said Robert L. Worden, the agency's chief. "We knew it was an insightful report," he said. "Then after Sept. 11 we said, 'My gosh, that was in there.'" Gannon said the 1999 report was part of a broader effort by his council to identify the full range of attack options of U.S. enemies. The vice president has repeatedly asked Congress not to investigate the intelligence failures. But with the new commotion, the White House now says it will cooperate with an investigation if it's done the right way.